Torturing some people can be embarrassing…. 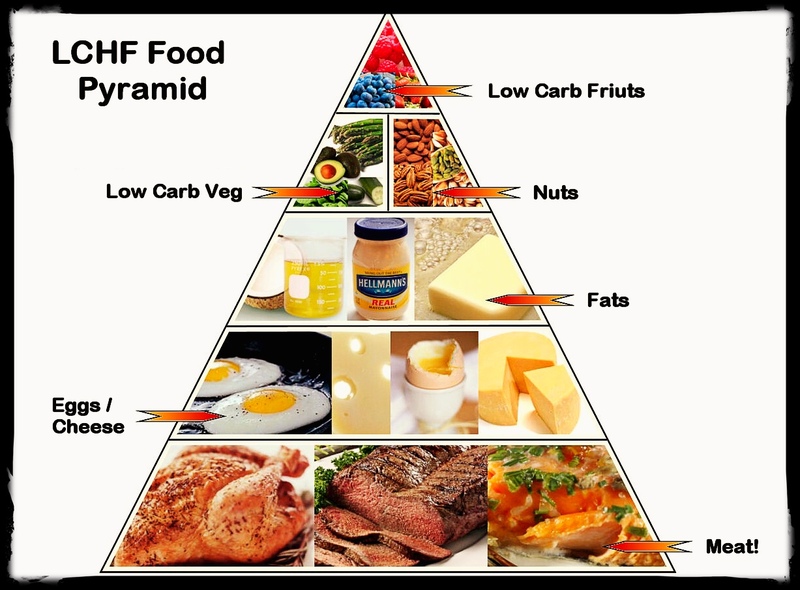 Found this drifting around online – the #LCHF Food Pyramid! This page is a brief overview of the journey which I am undertaking with regard controlling my weight. As of the time of authoring (Feb 2016), I’ve lost around 70lbs / 30kg of weight (And 12 inches from my waistline) by following the general principles of LCHF, combined with calorie counting and moderate exercise during my working day (Yup, that’s NOT going to the Gym!). 15g or under Total carbohydrate per day. 1200 or less calories per day, trying to get the bulk of calories in the order of the LCHF pyramid,as pictured. I’m human. I have moods, needs and desires. The principles outlined are very strict, but have produced amazing results – I lost the weight in just six months, and it is staying off. My personal maintenance calorie count is around 1800 a day, so if I wanted a treat, for example a drink, I could have some spirits (Rum/Vodka etc) with 0 cal mixer; or for a snack, a non-cake, some nuts, or LCHF dip with salad. I would allow myself to go up to around 1800 calories on those days when it was hard, when I needed some encouragement. I went into this with my eyes open, after reading everything I could find on the interweb. I didn’t dive straight in, however initially cut my carbs from whatever I was on (Crazy levels), to 100g a day, then 50g, 25g and 15g or under – this took a few weeks, and I avoided the common symptoms, such as mood swings etc. The gradual adjustment to the diet meant that it was/is easy to stick to and easy to follow. The Recipe Book contains a lot of the recipes I use for the diet on a daily basis. I’m sure, if you’re reading this, that you know what Ketosis (Fat burning mode!) is (If you don’t, go Google it! ), and that by sticking to the LCHF diet you enter this state. I bought a blood test meter and some strips to monitor my progress, and generally speaking I can now go from eating carbs on a diet-break, to a 2.2 level of ketosis inside 4 days of strict diet; so it is possible to take a holiday, live a little and not lose everything. After the months on the diet, I find it very hard to actually over-eat, even when presented with the open opportunity to do so, sometimes it’s difficult to hit the maintenance level of calorie intake without extras, or treats. As for exercise, I can assure you, the gym is not necessary for the weight loss – for the first couple of months, I didn’t alter my routines at all, and I’m an office-worker! What I did do after the first couple of months, is ditch the lift/elevator, and use the stairs – I won’t lie – this was hard at first, and I was always out of breath / sweating etc – six months on – I can run up 4 flights of stairs carrying a 40lb backpack, and whilst slightly out of breath, it’s nothing. Generally speaking I manage 20 to 30 flights of stairs daily now. Another routine I implemented was jogging up a couple of floors, walking around the floors some, and back down again when I needed the toilet – OK, it takes 5 mins more each time, but it is a way of burning some calories, and getting moderate exercise into your daily life. I have also read that exercise during the day in little bouts is generally better for fat-burning, as it keeps your body active all day, rather than just in one gym session! I’m now fitter and more able than many of the people who I’ve previously thought of as “Normal”; it’s a damn fine feeling.